printing not smooth more like pin heads. I guess the moves were all smooth, no pauses with this amount of wards? So the reason would then be an unsteady flow of filament. 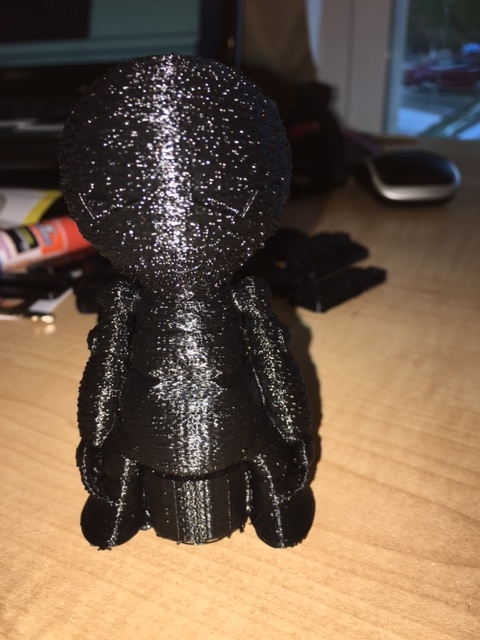 Can happen if filament is not hot enough and you are operating at extruders limits. An other thing is extruder not doing equal steps. If you have 16 substeps enabled it needs a certain power to hold these positions or it will move more between full steps and each full step will extruder bigger amounts which are then your blobs. Last possible this is simple overextrusion. Have you calibrated the extruder and found the correct extrusion multiplier for your material? Values of 0.85 are not uncommon. Now that the new cable is in and my baud rate is @115200 no issues with any errors and the majority of prints other guides and bracket's are smooth less some stringers.